Spurred by the economic benefits that clusters in the creative industries may bring to urban and regional economies, the concept of clustering has become a widely studied topic by among others cultural economists and economic geographers. Clustering of industries has traditionally been explained by the notion of agglomeration economies; later explanations included urban amenities and spinoff dynamics. These interwoven theories are discussed and tested in this theoretical and empirical study on the locational behavior of creative entrepreneurs. 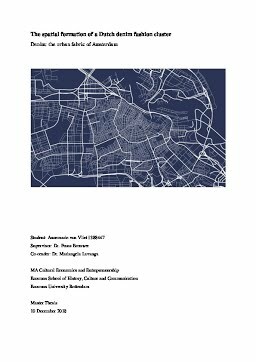 In addition, this study explores whether the symbolic power of cities could attract creative entrepreneurs and impact cluster development in the creative industries. This line of research is underexplored in academic literature, even though the creative industries heavily depend on symbolic knowledge as a source of product value. A qualitative approach has been chosen to study the case of the Amsterdam denim fashion cluster. The empirical part presents the results of 9 interviews with representative cluster participants. The study focuses in particular on Amsterdam-based creative entrepreneurs who have started their denim fashion related firms over the last decade. In addition, the perspective of the House of Denim on the past and future of the denim cluster and Amsterdam’s identity as a global denim fashion city is sought to enrich the results. Based on qualitative analysis of data, I conclude that spinoff dynamics explain to a large extent the emergence of new firms in the denim fashion industry in Amsterdam over the last ten years. The results also suggest that urban amenities strongly support this development, while the social and professional networking opportunities which arise from agglomeration bring additional benefits to the cluster participants. Place-based symbolic associations made by entrepreneurs may strengthen the distinctiveness and identity of Amsterdam as a fashion city in the international order.